I love it when I can transform ingredients into something totally different than what it was initially used for. I made some sautéed peppers and onions to go with something in a meal I was making. There was plenty peppers and onions leftover, and I did not want the same thing. By using two additional ingredients I was able to transform those simple peppers and onions into a wonderful creamy soup. This soup has a hint of orange, just enough to make the soup more interesting. I sprinkled a few pumpkin seeds for added texture and some fresh cilantro for added flavor and freshness. The recipe starts from the beginning – The Sautéed Peppers and Onions. Note: I like to use a large dutch oven to sauté the peppers and onions, because of the large cooking surface. Sauté onion, peppers and All-Purpose Seasoning over medium heat, until onion is translucent and the peppers are tender. If needed add vegetable broth to unstick the vegetables and deglaze the pan. Transfer peppers and orange(s) to high-speed blender. Ad just enough vegetable broth to help with the blending. I started with 1/2 c. Add more to achieve your desired thickness. 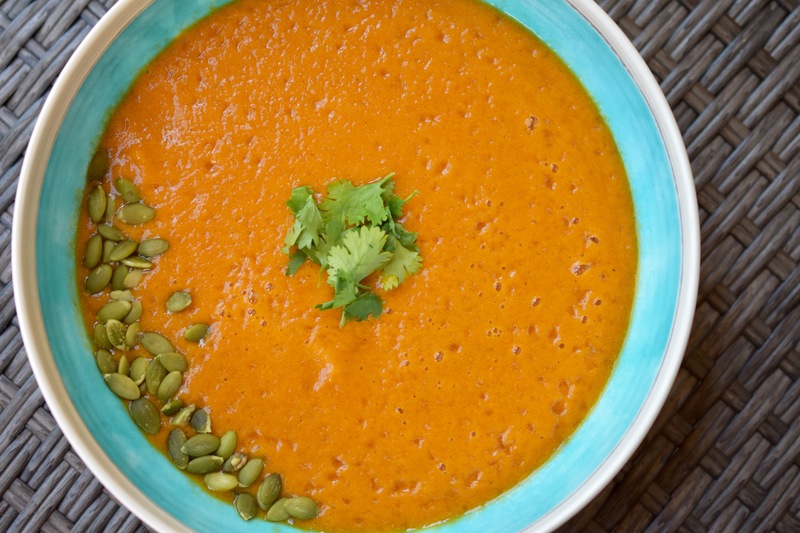 Pour into bowls and garnish with pumpkin seeds and cilantro.